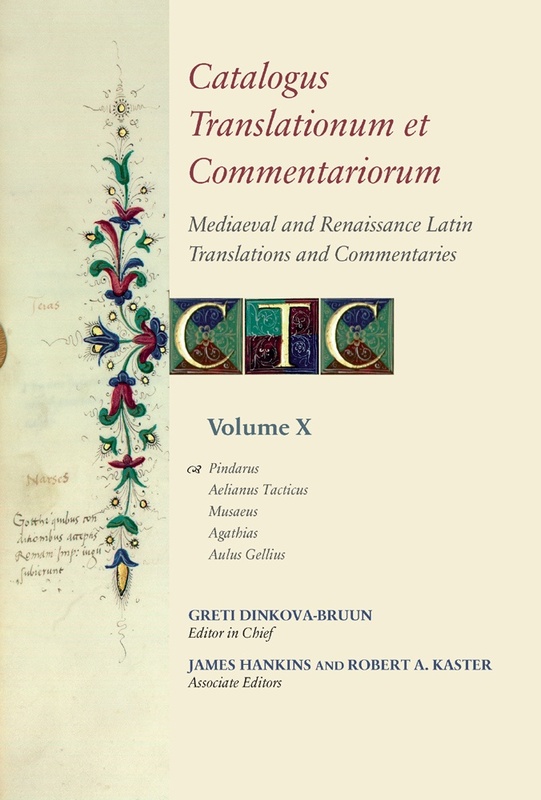 Founded in 1946 by Paul Oskar Kristeller, the Catalogus Translationum et Commentariorum has become an indispensable research tool for scholars interested in the history of the classical tradition in the West during the Middle Ages and the Renaissance. Each article treats a separate classical author, beginning with a detailed essay on the author’s reception from antiquity to A.D. 1600. This ‘Fortuna’ is followed by a comprehensive list both of manuscript and printed commentaries on each Latin author and, in the case of Greek authors, a list of Latin translations as well. Since the publication of the first volume in 1960, the Catalogus has published articles on nearly a hundred classical authors, with dozens more in active preparation. The project boasts an international team of contributors from fourteen countries in Europe and North America. Given the ever-growing interest in the history of classical reception across departments of English, European languages, and comparative literature, the foundational scholarship that is the hallmark of the CTC has become more vital to research in the humanities than ever. 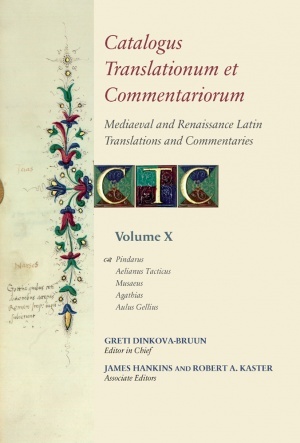 In this volume, the tenth in the series, five full-length articles devoted to Pindar, Aelianus Tacticus, Musaeus, Agathias, and Aulus Gellius are supplemented by addenda and corrigenda to articles previously published on Lucretius, Dionysius Periegetes, and Sallust. Greti Dinkova-Bruun is a Fellow and Librarian of the Pontifical Institute of Mediaeval Studies, Toronto. She has edited Alexander Ashby’s Opera Poetica for the Corpus Christianorum Continuatio Mediaevalis (2004) and The Ancestry of Jesus: Excerpts from “Liber Generationis Iesu Christi Filii Dauid Filii Abraham” for Toronto Medieval Latin Texts (2005). Her numerous articles have appeared in Mediaeval Studies, Viator, Sacris Erudiri, Mittellateinisches Jahrbuch, and Archives d’histoire doctrinale et littéraire du Moyen Âge, among other journals. James Hankins is Professor of History at Harvard University and founder and general editor of the I Tatti Renaissance Library, published by Harvard University Press. The author of a seminal study, Plato in the Italian Renaissance (1990; Italian translation, 2009), he is editor of The Cambridge Companion to Renaissance Philosophy (2007) and (with Fabrizio Meroi) The Rebirth of Platonic Theology (2013), as well as editor and translator of Leonardo Bruni’s History of the Florentine People (2001–2007) and editor of Marsilio Ficino’s Platonic Theology (2001–2006). Robert A. Kaster is Professor of Classics and Kennedy Foundation Professor of Latin Language and Literature at Princeton University. His books include Guardians of Language (1988), Emotion, Restraint, and Community in Ancient Rome (2005), and editions and translations of Cicero’s Speech on Behalf of Publius Sestius (2006), Seneca’s On Anger and On Mercy (2010), Macrobius’s Saturnalia (2011), and Suetonius’s De grammaticis et rhetoribus (1995) and De vita Caesarum (forthcoming).